The Eskom Development Foundation approved considerable funding towards a paediatric mobile unit, its maintenance and running cost, consumables, staff and medication for a period of three years. This unit will visit primary and secondary schools in four provinces (Mpumalanga, Limpopo, KZN and Free State) to provide the needed eye care, general health care and dental care for the next three years. This initiative is in conjunction with the provincial Department of Health. The Eskom Mobile Clinic has specifically been designed to reduce the barriers that children are often faced with during their educational careers. The Eskom mobile clinic consists of a dental booth, equipped with all necessary material to screen, polish, extract and do fillings on teeth, a Primary Health Care (PHC) consultation room to carry out general health check-ups; nutritional assessments, hearing assessments, gross and fine motor assessments, as well as immunisation and a visual care booth to assess their eyesight, provide the necessary treatment and even spectacles where necessary. Learners with severe medical problems that cannot be treated within the mobile units are referred by the medical staff to the nearest clinics and public hospitals. 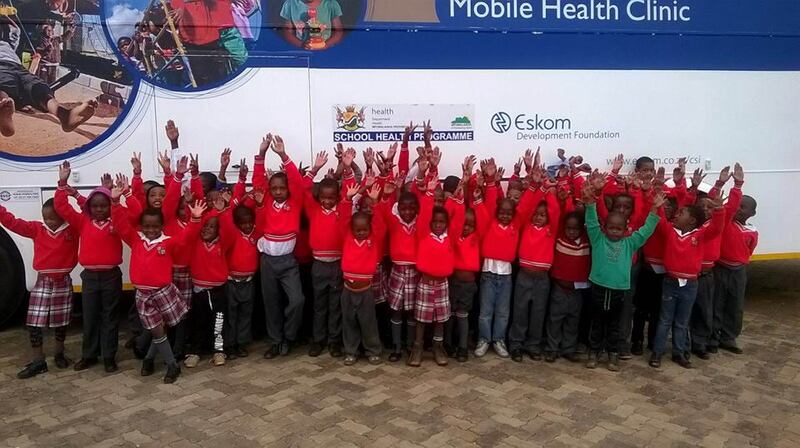 To date, the Eskom mobile clinic has visited 432 locations and screened 35 030 learners since March 2014. A total of 658 spectacles have been prescribed and distributed. Provision of spectacles for learners. Identification of conditions that parents/school/learners were not aware of. Excitement and expectations of the community at large. Positive feedback from schools and crèches.